We offer various Spanish courses for groups. Each class has between 5 and 8 students per class, and each course is 15 hours. If you are eager to learn Spanish in a social environment we encourage you to give one of our group courses a try! 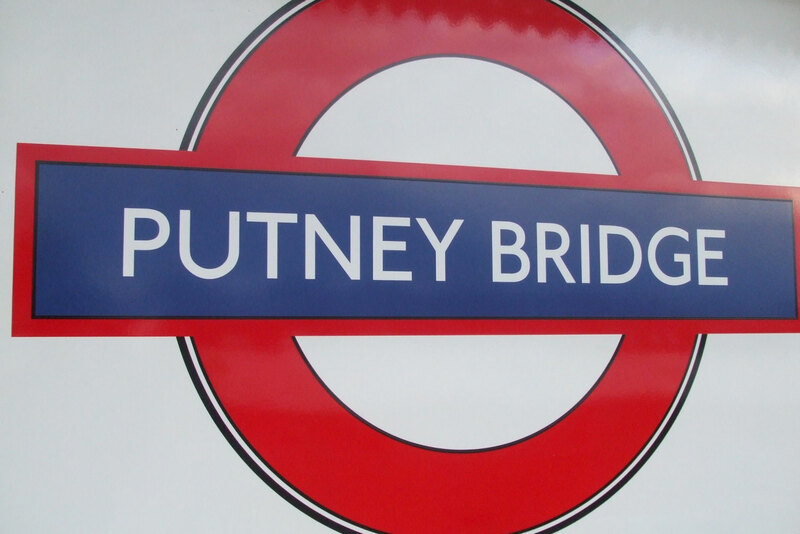 If you enjoy learning in a social environment - our Putney Spanish group lessons are for you. Receive a 5% discount if you book more than 2 weeks in advance. Receive a £10 voucher for every friend referral who completes 5+ lessons. Need help calculating what your ideal lessons will cost? Use our clever Price Calculator. We offer various courses to suit your level and needs. Please note, all our group courses are for between 5 and 8 people and are run out of St Marys Church in Putney. If you are taking Spanish lessons for the first time or you feel like starting over. You have proficient use of all content of previous modules as well as being able to deal with shopping situations (e.g prices, sizes, colours etc.) You can describe yourself/others (physically/personality) and talk about likes and preferences. It is also essential you can talk about habits and routines. If you have finished our Beginner (A1) Level or completed 40hrs of recent study that allow you to speak about your daily routine as well as experiences that you have had in the past (I have traveled/studied/been etc.). If you have finished our Module Elementary 1 or have completed 60hrs of recent study that enables you to speak about events of the past and their duration (e.g. I saw a play 2 months ago). You should also be able to describe and compare different types of housing and the location of objects in a room. If you have finished our Module Elementary 2 or have completed 80hrs of recent study that allows you describe what is happening at present (e.g. it is raining) and also talk about a recent past activity (e.g. I have found a job). If you have finished our Module Elementary 3, or have completed 100hrs of recent study that allows you to give advice using the imperatives (e.g. Don´t drink coffee, take an aspirin). You are also expected to talk confidently about recent past travels (e.g. I have been to Barcelona many times, in fact, I went there last summer). Similar to ‘Foundation GCSE' level Spanish. If you have finished our Elementary (A2) Level or completed 120hrs of recent study that allow you to talk about historical events, customs, and circumstances of the past. Also for those with recent GCSE (higher). Similar to 'Higher GCSE' level Spanish. If you have finished our Intermediate (B1) Level or completed equivalent study that allows you to make subjective judgements about current affairs. You should also be able to talk about what you would do in imaginary situations. If you have finished our Module Advanced 1 or completed equivalent study to be able to analyse, comment and debate on news stories. You should also be capable of giving advice, making suggestions and recommendations using the subjunctive form. The use of passive voice is essential. 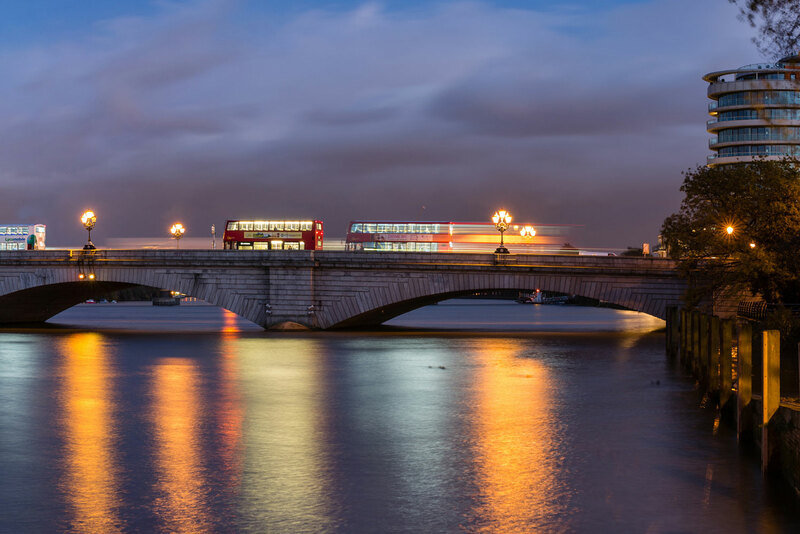 If you have finished our Module Advanced 2 or completed equivalent study that enables you to describe cities in detail and talk about travel expectations and experiences. The use of perfect subjunctive is necessary. If you have finished our Module Advanced 3 or completed equivalent study to be able to make subjective judgements about the past and also to discuss and reach agreement on any topic. (You should be capable of using the imperfect subjunctive form). Similar to 'High A Level grade' Spanish. If you have finished our Module Advanced 4 or completed equivalent study that enables you to talk about what you would have done under certain circumstances. Also for those who had an extended stay in a Spanish speaking country in the recent past and have the ability to conduct a conversation with accuracy and fluency. If you have finished our Module Superior 1 or completed equivalent study that enables you to fluently express and defend a point of view as well as refuse and accept other opinions. Also for those who had their Erasmus(or equivalent) year abroad at a Spanish university. If you have finished our Module Superior 2 or completed equivalent study to be able to actively interact and debate using expressions at an advanced level. You are expected to be able to give presentations on complex topics. Can express yourself spontaneously, very fluently and precisely, differentiating finer shades of meaning even in the most complex situations. 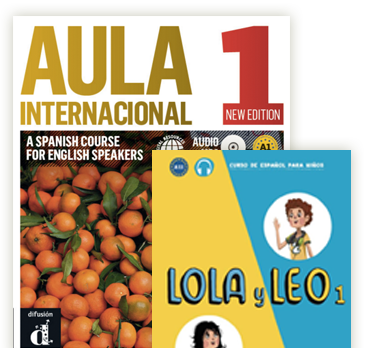 For children taking Spanish lessons for the first time or learning Spanish at school as a modern foreign language (MFL). This course aims to promote confidence and encourage elementary communication in Spanish. The program is in line with the Key Stage 2 Framework for languages (KS2). Why join a Spanish Group Class with us? You will be given a free "Spanish and Coffee" ringbinder to keep all your notes in order. We teach our group Spanish lessons in a modern classroom adjacent to St Marys Church in Putney. See a map. 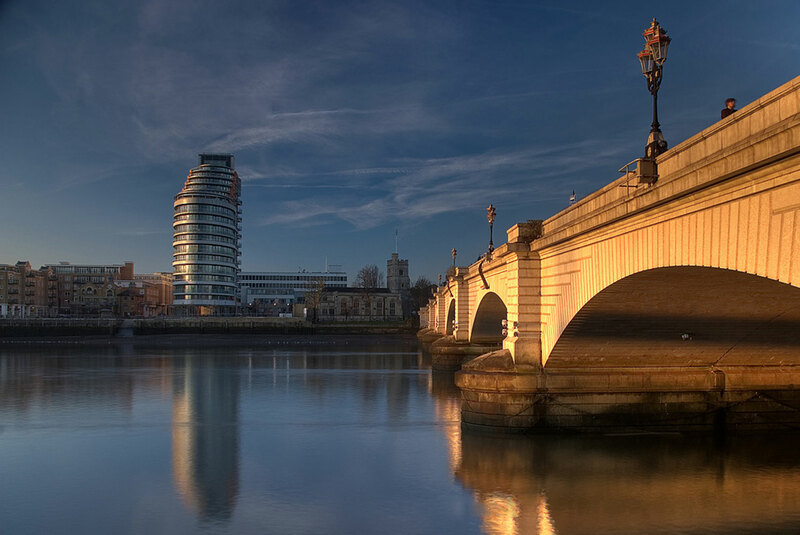 The classroom overlooks the River Thames and has an outside balcony that is big enough for classes on sunny days. There is free parking included, and a delicious delicatessen downstairs. Homework greatly assists progress so we do assign between 1 and 2 hours of homework a week for all courses. If you’re too busy some weeks that’s fine but we do encourage you to try to catch up so you don’t fall behind everyone else. There are 9 teachers in the team, and all are highly experienced and qualified. Collectively the team has 58 years of university studies among us. All the teachers are native Spanish speakers with half the team being from South America, and half being from Spain. We all love teaching and are passionate about helping students become fluent in Spanish in a relaxed and enjoyable environment. All ages and Spanish levels are welcome to join our Spanish Group Lessons, and you can join as an individual or couple. Equally, if you and 7 friends want to book all the spots on a course - you can! Test your Spanish skills!. Our Group Spanish classes will only ever have 5 - 8 students per course. We’ve intentionally made them small so that each of the students get plenty opportunity to engage with the class and interact with the teacher. We know you’ll really appreciate our class sizes. 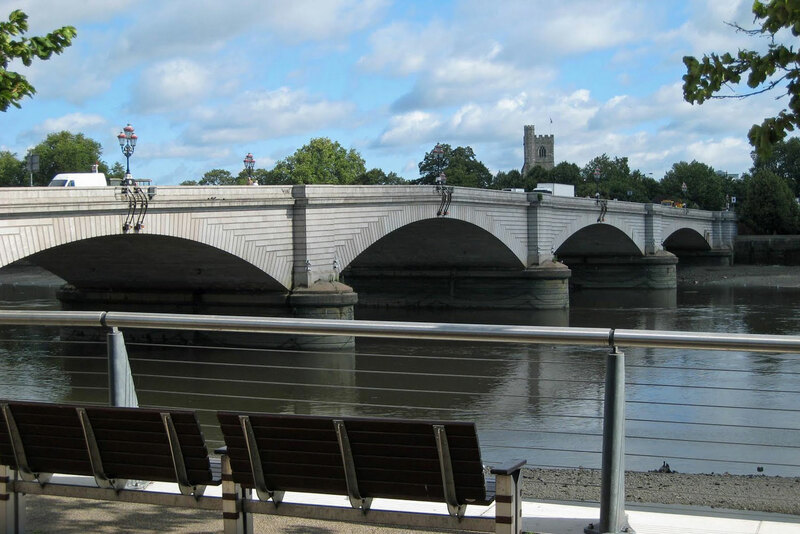 We teach our group Spanish lessons in a modern classroom adjacent to St Marys Church in the heart of Putney. The classroom overlooks the River Thames and has an outside balcony that is big enough for classes on sunny days. There is free parking included, and a delicious delicatessen downstairs. 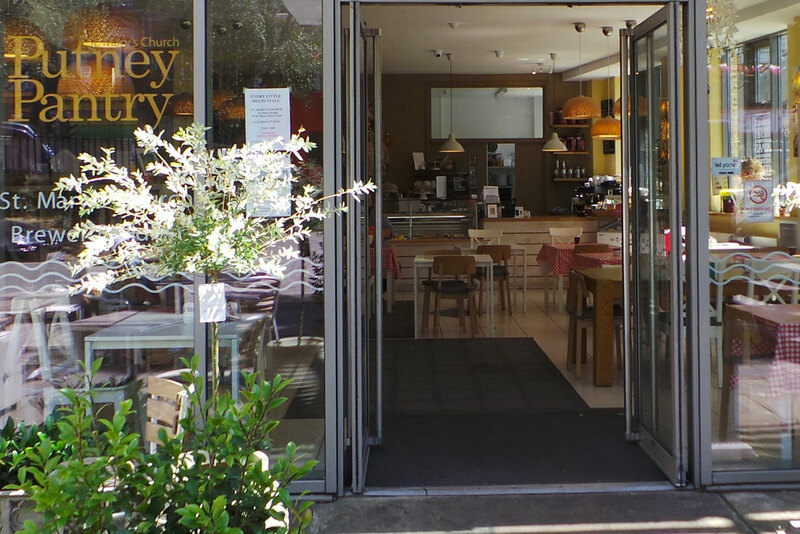 The full address is St Mary's Church, High Street, Putney, SW15 1SN. We’ve arranged free parking for all students attending our group lessons. We’ll send parking details upon booking. Coming by Tube or Train? 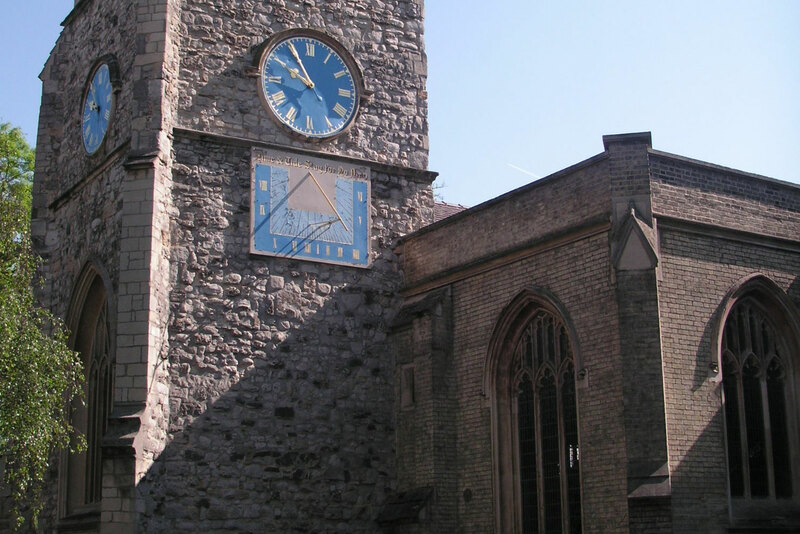 St Mary’s Church is a very pleasant 7min walk from either Putney Bridge Tube Station, or Putney Railway Station. 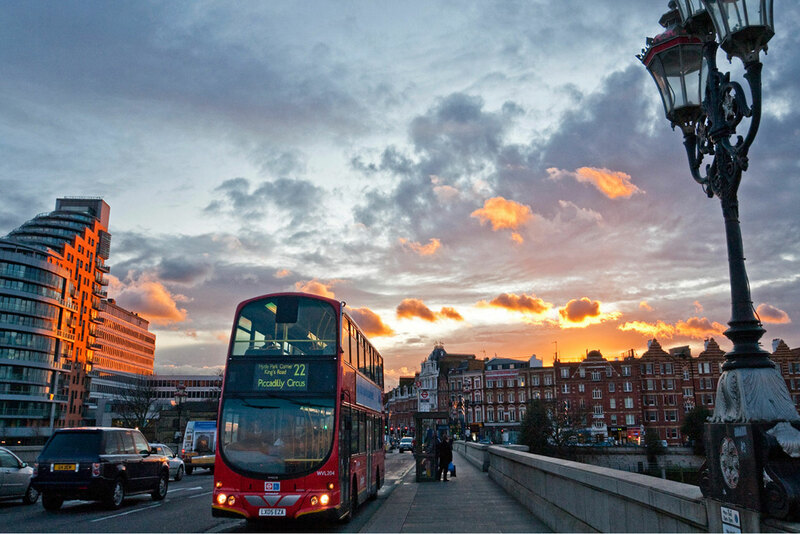 The following buses pass by: 22, N22, 424, 14, 39, 85, 93, 430, 485, 265, 220, 74, N74. Just another little thing we thought we could do to help our students. Receive a £10 Gift Voucher if your friend does more than 5 classes. We believe it’s most beneficial to our students if we limit each group class to 8 people. If there are more students it limits the amount of focus each student can receive from the teacher. In order for us to offer the low prices we do, we need at least 5 people to commence a group course. If we do not get enough registrations 7 days before the course starts we will postpone the course start date and let everyone know by email. If this does not suit you we will refund all monies paid. Can I join a group lessons if it’s just me? Yes, absolutely. Most people that join group classes join independently. Joining a group course is a great way to meet friends and learn in a social and fun environment. No problem, all notes and homework will be emailed to you. How do I know which group lesson is best for my Spanish level? You can book a free one-to-one assessment of your Spanish level. This usually takes about 30mins. 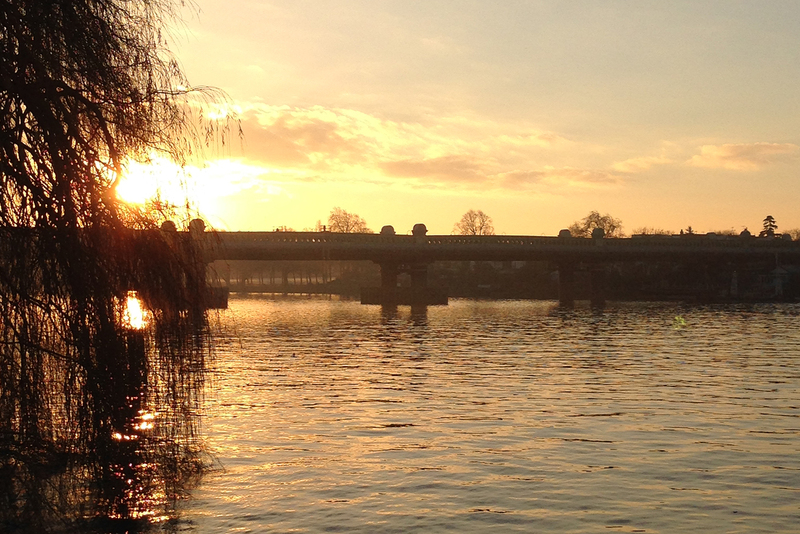 If you are considering a group class you will need to come to Putney for the free assessment. Get in touch today and book your free Spanish level assessment! Yes! And it looks great so you will be able to proudly display it for all to see. Where are your group lessons held? Will I be taught Spanish from Spain and South America? What happens if there is a bank holiday? Group lessons are not held on bank holidays or bank holiday weekends. What happens if I need to stop my course mid way? Unfortunately, we do not offer refunds for partly completed group courses, and it is not possible to offer your place to somebody else. You will have the opportunity to pay when you book. You can pay with any bank card or with Paypal. If you would prefer to book and pay by email or phone that is fine too. 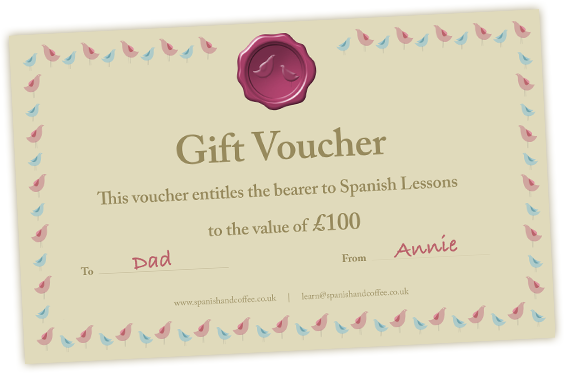 Please mail learn@spanishandcoffee.co.uk or call 02088711704. Can I arrange a group course for just my friends and family? Yes, if there are between 5 and 8 of you this is possible. 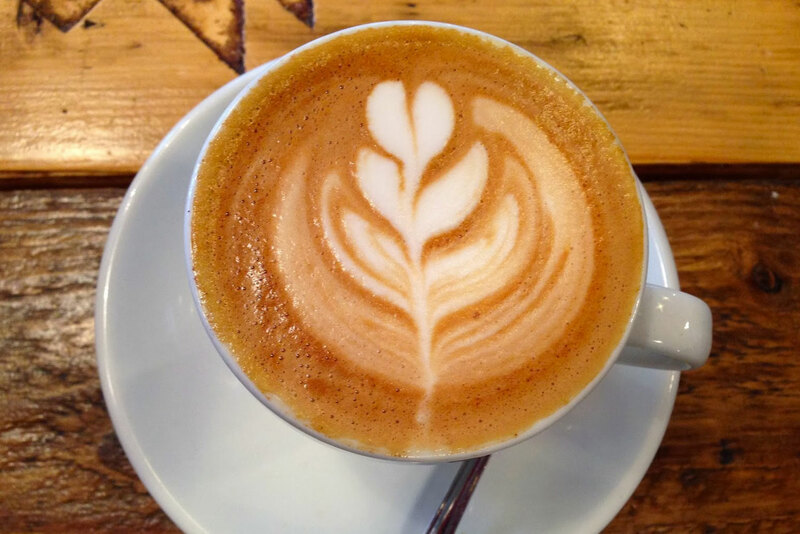 Please either use the booking form, or for anything custom please mail learn@spanishandcoffee.co.uk or call 02088711704. Can I arrange a group lesson at a different time or day than advertised? Yes, if there are between 5 and 8 of you we can arrange a custom course for your group. Please mail learn@spanishandcoffee.co.uk or call 02088711704. Can I arrange a group lesson with a different focus of study to that which is advertised? What will I need to bring to each lesson? You will need your textbook, notepad, pencil and eraser to each lesson. We will provide you with additional study notes each week which you can add to your Spanish and Coffee folder (that you will be given at your first lesson). Will I need to buy a textbook? Yes, we will confirm which book upon successful booking. Textbooks usually cost anywhere between £10 and £25. Can I get a refund if I decide to cancel my group lesson booking? Yes, we provide refunds up until 7 days before the group lesson course start date. Homework greatly assists progress so we prefer assigning it, but if your schedule is manic or you simply don’t feel like it, that’s fine, too. We can work around your ambitions and schedule. You can expect homework assignments to take between 1 and 2 hours a week. Are there discounts available for group lessons? "Really enjoying my lessons with Marta. She is a great tutor and is helping me become more and more confident with my Spanish. I love my lessons!" "I enjoy my lessons - Alba is very encouraging and professional. I would also class her as a good friend. I can't wait for my next class on Tuesday. x"
"I didn't know anything in Spanish, but due to Monica I managed to study lot of things. She encouraged me to be confident with my Spanish and inspired me during the lessons." "We really love the fact that Mercedes mostly speaks Spanish in our lessons which forces you out of your comfort zone and the results are noticeable." "I have lessons with Ana and I'm very happy. First time I see that a teacher can be so excited of their work. She always tries to give me the maximum." Give Spanish as a gift! What better gift than giving a language - that will last a lifetime. Our beautifully printed vouchers are sent 1st Class same day if ordered before 3pm. We've investigated the most popular Spanish books and Spanish mobile apps. Have a look through our recommendations and let us know if you have any more you think we should add! This library has the teachers’ favourite Spanish language films and it is free for students of Spanish and Coffee. 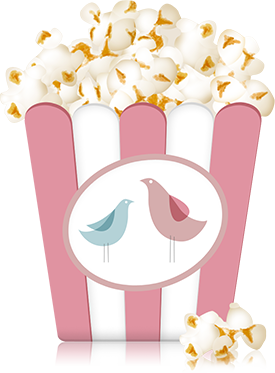 Simply browse and request the film you want to watch and your teacher will bring it to your next lesson! 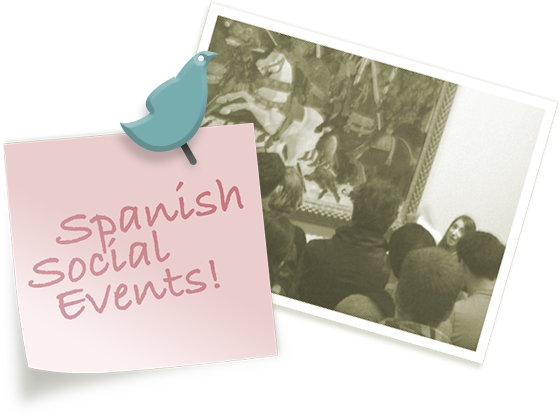 See you at our next Spanish Social Event? Our Spanish Social Events are for our students to be exposed to Spanish outside of their lessons. They’ve proven very popular and help with learning and confidence building - and they're a fun way to meet new friends too! We have been fortunate to have students from some of the most prominent companies around. Below is a small collection of the most notable companies. Your referral has been successfully sent. If your friend completes 5 lessons you’ll be sent a £10 Voucher.